Krav fitness incorporates all the elements of combat ready fitness, whether you are getting ready for boot camp or just want to be a lean, mean, fit machine. Strength training is important for men and women of all ages. Martial artists have been engaging in this pursuit for far longer than the average population. Martial arts requires fitness, and, produces fitness.The fitness goal that we work towards is to feel good, maintain a healthy body, and develop practical strength. The result will be that you will feel better about yourself, and look better as well. There was a time when exercise was only for those 'crazy fitness fanatics', today we know that proper strength training can increase and restoring bone density,and prevent and fight osteoporosis by building strong bones. It also helps prevent injuries; strength training exercise strengthens our bones, ligaments, and tendons. 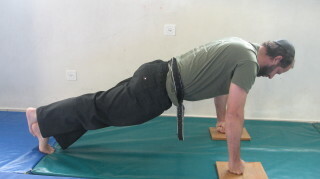 By doing push ups, you can train your triceps, chest, shoulders and abs all at once - a great time efficient workout. Boxing is a great way to burn calories and increase practical strength. To make it more interesting, and more difficult, we add the martial arts; do a squat, come up and do three punches; jab, cross, jab. Do a squat, come up and do two kicks; right leg, left leg. You can a set of only squats, squats with kicks, squats with punches, or a combination of all three. Variety keeps it more interesting. When we work out, we never stop; we run, then do push-ups, then sit ups, then punch and kick, then squats, this is our version of interval training. You are burning calories and gaining strength, and you are not spending your entire day doing it. It is effective and time efficient. For a great site on exercise and weight lose, visit diet weight loss . Women Self Defense . Women in the Israel Defense Forces .